American Express Presents TimesCity Gourmet Week turns 2 this year.It is a gastronomical celebration showcasing Times Food Award winning restaurants across 6-cities, Gourmet Week brings you critic curated, specially priced menus that highlight the best offerings from participating venues at reduced rates. ‘Eat what you love, love what you eat’ is what Times City stands for. American Express Presents TimesCity Gourmet Week is in Delhi, Chennai and Bangalore from September 1st to 7th and then moving to Mumbai, Pune and Hyderabad from September 15th-21st 2014. 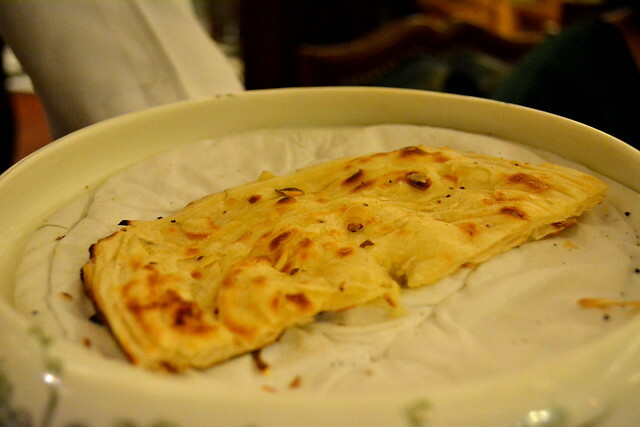 One of the most sought after restaurants in Bangalore is Dum Pukht Jolly Nabobs – ITC Windsor which offers North West frontier cuisine.A feast fit for the king. 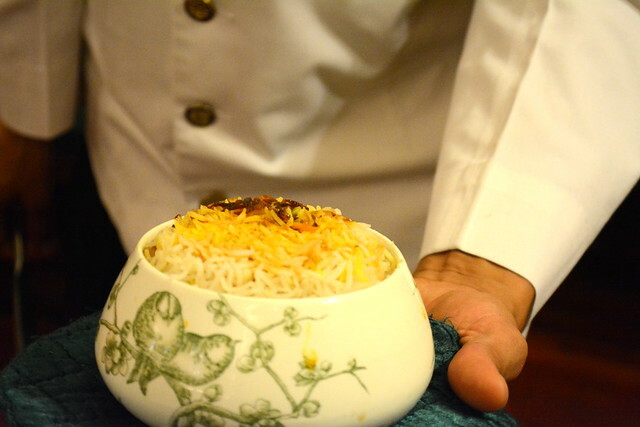 Always have been longing to visit this restaurant for its famed biryani and its rich north Indian food. As we entered the restaurant,had the feeling that we were teleported to the early 19th and 20th century during the British era with the artifacts, the guns, chandeliers etc.The decor was just fantastic and blends seamlessly with the theme of the restaurant. We were offered the Gourmet week menu and had selected the vegetarian meal which is a 3 course meal. We started off with The kebabs.The first on the plate was “KHUS KHUS KEBAB” .A perfectly made kebab with poppy seed pasted mixed with finely chopped fresh vegetables and fried in mustard oil.It was very crisp and full in flavors in every bite. 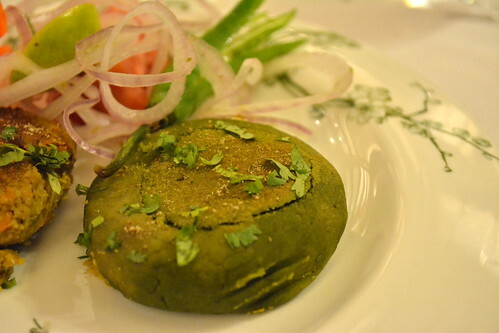 The next kebab is “HARRA KEBAB” which is a shammi kebab made of spinach and channa dal which is pan grilled in butter & served with sprinkling of fenugreek.This is one of the best shammi kebab i have ever eaten,its soft, crisp and delicately made.its just lip-smacking and couldn’t each just one. The main course consists of “Guncha- o -keema” which is small pieces of cauliflower prepared with cubes of capsicum and tomatoes cooked in a smooth tomato and kasoori methi gravy.the gravy was rich in texture and taste. 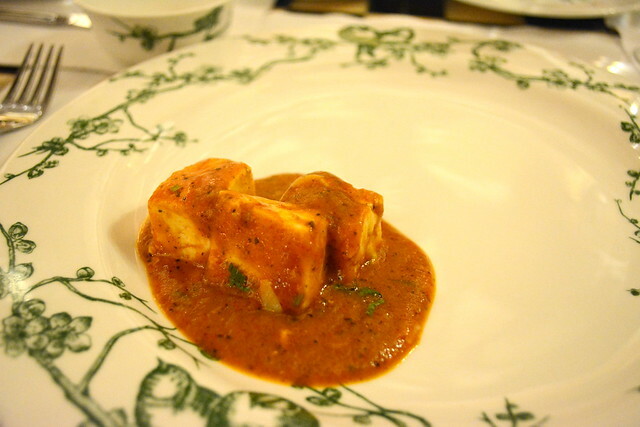 “Qasar-E-Pukhtan” is paneer cubes sauteed in fresh tomato puree flavored with fenugreek and cream.Loved the dish with rich tomato flavor and soft paneer melting in your mouth. 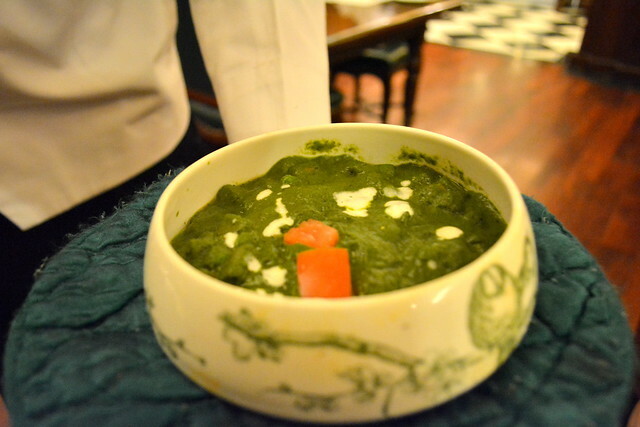 “Sub miloni” is fresh vegetables cooked with spinach gravy. 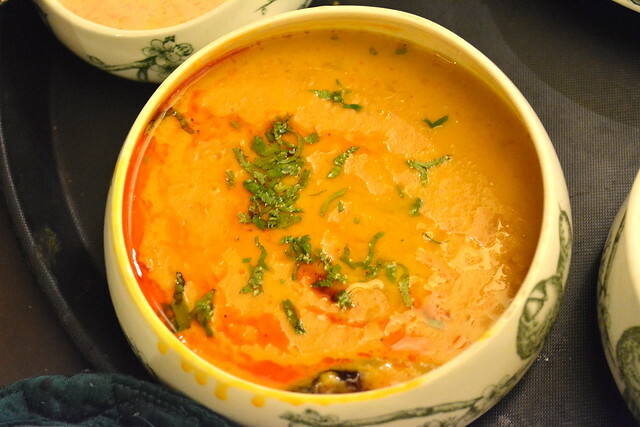 The star of the evening was “DAL DUMPUKHT QURESHI” One of the best dal i have ever had and it is the secret recipe of the master chef’s family recipe which consists of arhar dal with hung yogurt,exotically tempered with burnt garlic.This is one dish you would lover to eat again and again. 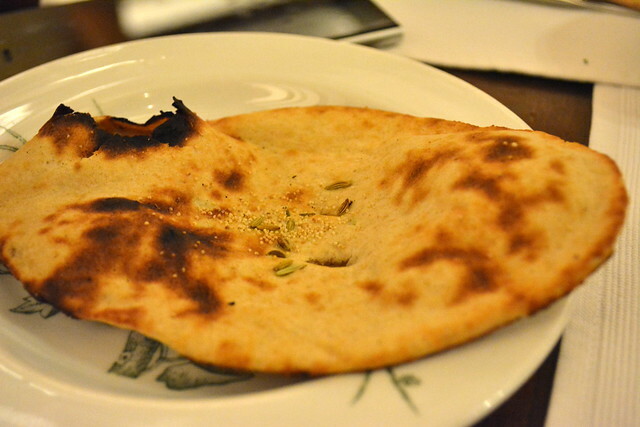 “Naun-e-beh Khummach” is leavened semoline bread sprinkled with poppy seed and aniseed,baked in a tandoor which goes perfectly with the DAL DUMPUKHT QURESHI. The accompaniment for the gravy is “WARQI PARATHA” which is a multi layered bread with ajwain flavor based in a clay tandoor. 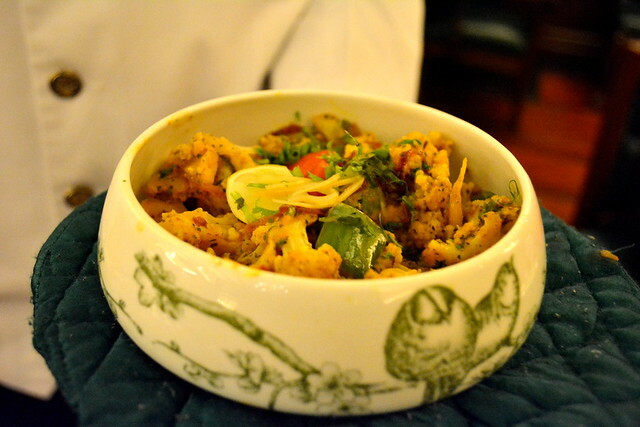 The showstopper of the evening is “SUBZ BIRYANI” for which i have been waiting for and it sure didnt disappoint me. Loved the fragrance and the DUM in which vegetables and basmati rice was cooked.Truly authentic taste. The whole meal cannot be complete without desserts and the fest fit for the king is completed by “KULFI LAB-E-MASHOOQ”.It is kulfi with almonds with corn starch vermicelli in herbal syrup. 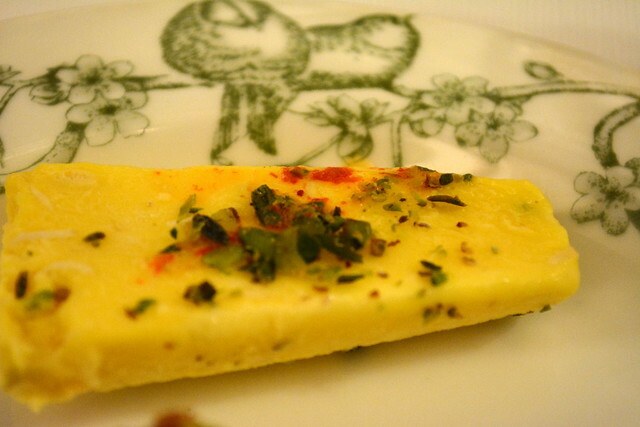 Loved the authenticity of the dish. 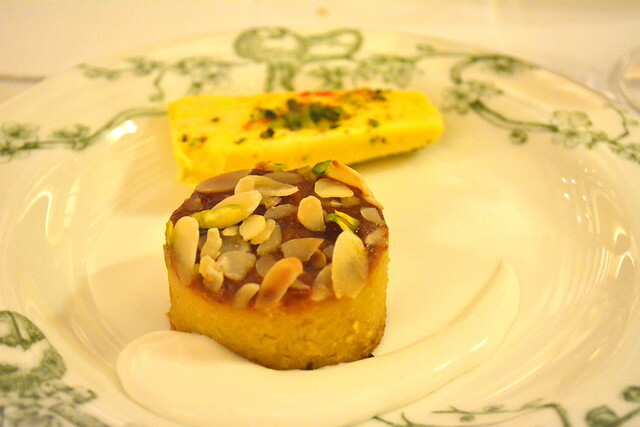 “BEGUMS PUDDING” is the dessert for the nawabs.It is a awesome pudding of evaporated milk or khoa mixed with ground almonds and saffron,strewn with raisins and nuts.Served with delicate brandy sauce. 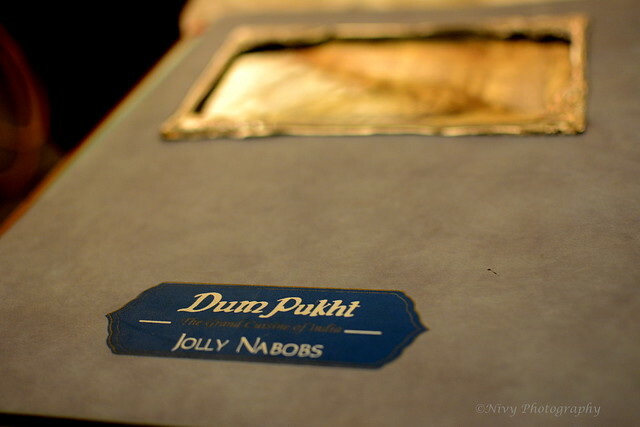 Finally,we loved each and every signature dish at Dum Pukht Jolly Nabobs and definitely deserves the title of being the best restaurant in Bangalore.